Film studio Eros International Media Ltd has partnered with IP Avenue, a Mumbai-based technology company to bring in-flight entertainment to low-cost carriers. 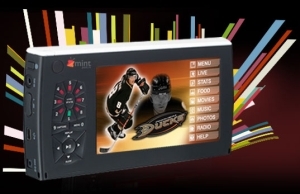 A 5.3-inch wireless interactive hand held TV called Mint Pod (deployed by IP Avenue) will provide personalized entertainment to air travellers at a nominal fee. Although airlines like Kingfisher provide in-flight entertainment in the form of movies and television channels displayed on screens at the back of the seat head-rests, there is no such provision in low cost airlines. The two parties are wagering on this need for entertainment on low cost airlines. The lure can be the growing business of low cost airlines in India, who together command over half of the total air passenger traffic (including low cost carriers of Jet and Kingfisher) in the country. Founded in January 2008, IP Avenue is a technology company with operations in Mumbai, New york, California and Tokyo. The company is involved in back office operations, multimedia and convergence technologies. The Eros in-flight entertainment division already provides Indian and international programs to more than 35 international airlines flying to India. The Mint Pod will provide over 30 hours of content in the form of entertainment programs such as movies, fashion shows, cartoons, travel shows and laughter shows. Mint Pod is already available for rent in flights like Go Air and will soon be made available in other Indian low cost carriers and a few International carriers. The content of the device is encrypted and aviation copyrighted and can only be heard with help of headphones hence is disturbance free. The device allows browsing, fast forwards and rewinding. "Presently, we are one of the largest licensing companies for Indian film entertainment to a number of key airlines including Air India, Jet Airways, British Airways, Delta, Emirates, Kingfisher, Singapore Airlines, Lufthansa and Virgin Atlantic. We understand that the very business model of low cost carriers doesn't allow personalized entertainment systems on board. Sensing opportunity in this space, we decided to tie-up with IP Avenue and provide personalized entertainment to passengers through their interactive Nano TV," said Prashant Goankar, Vice President, In Flight Entertainment, Eros International Media Ltd. Earlier this year, Eros announced that it will digitize and catalog its library of 2000 films. The company also appointed Ricky Ghai as chief executive of its digital and new media arm.